Iran would welcome cooperation with Swedish companies in projects concerning optimization of energy consumption and reduction of greenhouse emissions, Iranian Minister of Petroleum Bijan Zangeneh said. 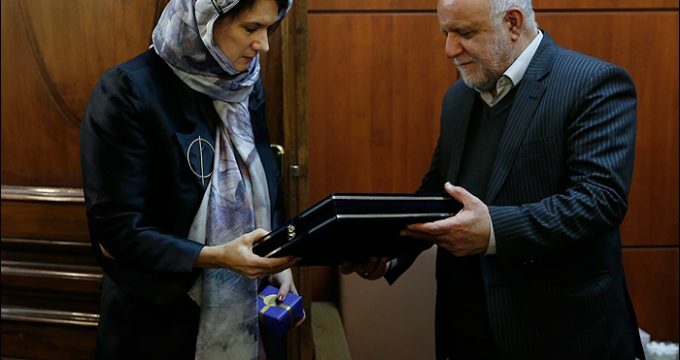 Following a meeting with a Swedish delegation headed by Sweden's Minister of EU Affairs and Trade Ann Linde here in Tehran on Saturday, Zangeneh said discussion regarding cooperation between Iranian and Swedish companies in projects that concerns optimization of energy consumption and CO2 emission was the highlight of the meeting. Swedish Prime Minister Stefan Lofven arrived in Tehran on Saturday for a 3-day visit. He was officially received by Iranian President Hassan Rouhani in Tehran and met with Supreme Leader of the Islamic Revolution Ayatollah Seyyed Ali Khamenei. In addition to economic matters, Lofven was also in Iran to discuss cooperation on various other issues, including science and technology, higher education and technology. Sweden has a good name among Iranians and is seen as a reputable economic partner, Iran's Supreme Leader of the Islamic Revolution Ayatollah Seyyed Ali Khamenei said on Saturday during a meeting with Lofven. Lofven also met President Hassan Rouhani, who praised "Swedish moderation" in international affairs - especially its support for Iran's negotiations with world powers which led to a 2015 deal to curb Tehran's nuclear program in exchange for a removal of economic sanctions against the Islamic republic. Neutral Sweden has generally had good relations with Iran. Zangeneh underlined cooperation of Sweden's Scania with Iran's Mammut in production of heavy trucks and buses which began after a Swedish delegation visited Tehran a year ago. "We signed a deal to support manufacturing trucks in Iran which includes cooperation of Mammut and Scania," he said. "We also suggested during the meeting that Swedish companies can work with Iranian partners to produce gas-powered buses used for urban transportation."